What does this mean for most people? Hopefully not much impact, but if you depended on the Service Console for your agents and other management tools you will need to become more familiar with working from a central management tool, scripting, SSH, and command lines. Essentially all authorized VMware agents will now run directly on the VMkernal, removing a large amount of the ESX footprint. One thing you can do is start familiarizing yourself with VMware vSphere Command Line Interface (vCLI) and the VMware vSphere PowerCLI tools. These scripting tools are used to manage both ESX and ESXi (replacing the COS command line that was in ESX). –vCLI is a command line interface utility designed to help with configuring and provisioning your ESX hosts. This will help with automation the initial configuration, troubleshooting and other diagnostics. –PowerCLI is the command line tool for vSphere management. Among the most popular uses include network, storage, VM’s, and guest OS’s. This works well with Windows PowerShell and fits in with 3rd=party applications. Also you will want to start planning the transition to ESXi when you perform the upgrade to 4.1. It makes sense to do this since you will already be planning and implementing the upgrade. At the very least, you would want to start deploying all future hosts under the ESXi platform. Because ESXi carries such a small footprint it has leveraged a partner based API system to help with the management tasks. This means a lot of the task you were using for ESX and the 3rd party vendors may be impacted. According to VMware the majority of the system management, back up and monitoring vendors support the ESXi API-Based system, however it is recommended that you check with your vendors for compatibility. With that said, before any migration it is recommended under best practices guide to test, test, and more testing to make sure you don’t break anything during the transition. Make sure you understand deployment (pre-install, post-install, and first-boot). Once you get comfortable with the scripting tools, go over those in your test environment and make sure they go smoothly. Hopefully this was of some help. 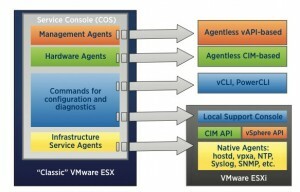 When you are ready, there is a pretty good ESXi migration guide posted by VMware. Good luck!